Walt Disney World characters are a huge attraction in themselves, and we are always on the hunt to meet them all. 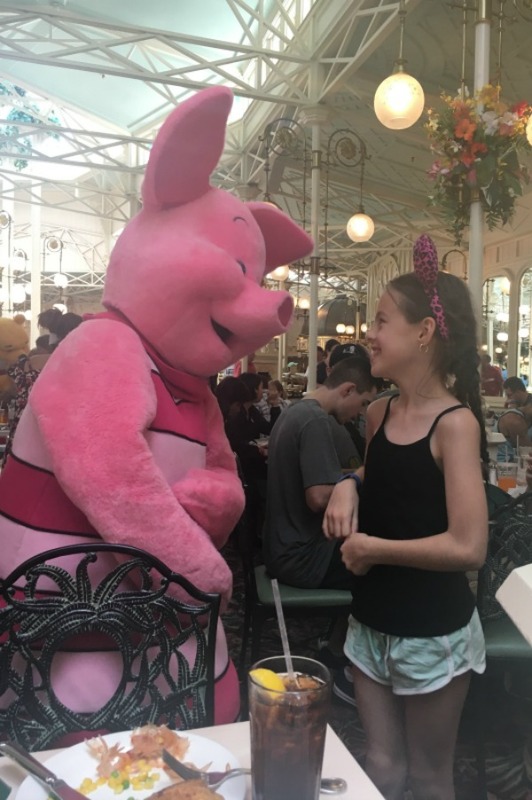 It can be a good idea to take advantage of Disney World character dining restaurants to meet multiple characters in one go and cut down on the wait times. 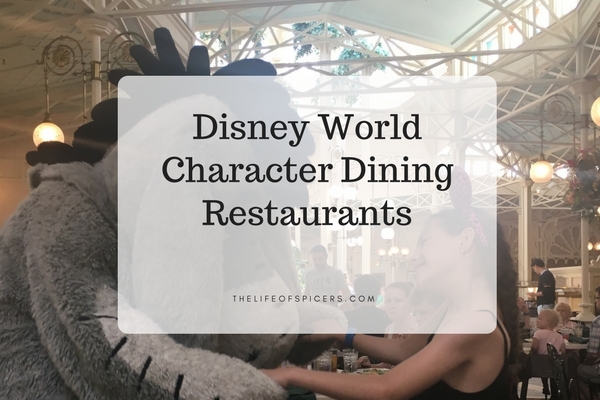 If you’re on the Disney dining plan, these character dining restaurants are good value for money for the dining plan credits you will spend. There are so many Walt Disney World character dining reviews available, which is a great way to read up on everything before you go. The prices for character dining at Disney World change according to season, demand and time of the day. For example breakfast is often cheaper than dinner. 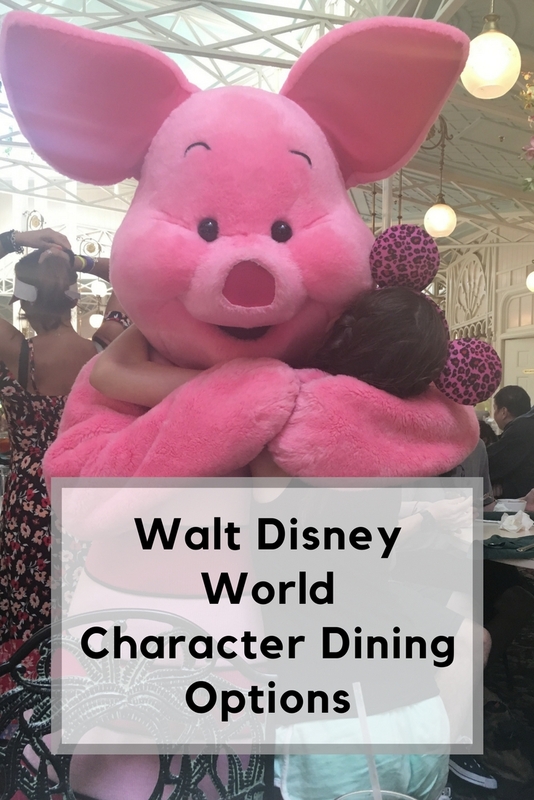 Character dinners at Disney World are very popular and it’s always best to book character dining at Disney World in advance for any particular restaurants you want to eat in. When I think of Magic Kingdom, I think of bright, busy colours and amazing attractions. Magic Kingdom is by far my favourite Disney park to visit and we always make it our first stop on a Disney holiday. character dining at Magic Kingdom includes three character dining restaurants and one character dining party. Cinderella’s Royal Table can be found inside Cinderella’s castle. Meet Cinderella herself before you take the winding staircase up to the restaurant. During your meal service (breakfast, lunch or dinner), whilst the menu will vary, the style will stay the same. You will have the chance to meet and chat with the princesses as they tour the restaurant. Princesses are subject to change, however you can usually expect to meet Ariel, Snow White, Jasmine and Rapunzel. If you are using the Disney dining plan, this restaurant will cost you two credits for your meal, making it one of the more expensive uses of the credits. The restaurant does get busy so we would advise you book before you go. We have enjoyed lunch at Cinderella’s Royal Table, and think it’s one of the best restaurants in Magic Kingdom to meet lots of characters without the queues. Tiana’s Riverboat party is an experience we have yet to try. Located on the Liberty Square Riverboat, you can join Princess Tiana and Naveen for treats of ice cream and a special viewing location for the Festival of Fantasy Parade. Tiana’s Riverboat Party is not available as part of the Disney Dining plan. 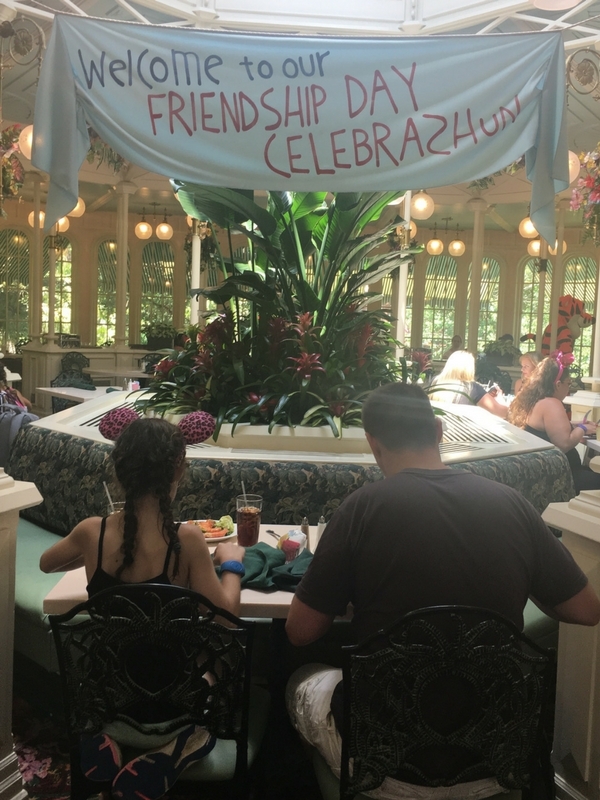 We have walked past Crystal Palace restaurant so many times during our visits to Walt Disney World, so on our last trip, we decided we were going to enjoy lunch on our first day. This turned out to be a great idea as it was really hot and the restaurant provided some amazing relief from the sun. Crystal Palace restaurant can be found next to the hub area at the end of Main Street. You can enjoy breakfast, lunch or dinner and meet Winnie The Pooh, Tigger, Eeyore and Piglet. Food is served buffet style and we found that there was a good choice available during our lunch experience. Our drinks were topped up frequently, and we were able to sample all the different options. I loved the fact that I could fill my plate with vegetables if I wanted. The characters in Crystal Palace were very attentive and energetic. We had some brilliant interaction during our meal experience and it’s one we will definitely repeat in the future. Crystal Palace restaurant is available on the Disney dining plan and will cost you one table service. credit. This works out to be excellent value when using the dining plan. Be Our Guest is my one of my favourite Magic Kingdom restaurants. 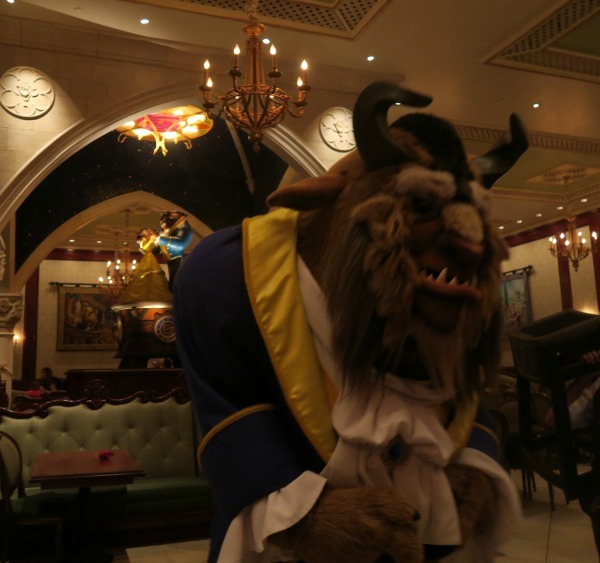 Whilst it isn’t technically a character dining restaurant as the beast only appears during the dinner service. I felt it deserved a mention as if you are looking to meet the beast then this is the place to see him. Dinner service changed in July 2018 and is now a two credit dining plan restaurant. It was always great value as a one credit meal, so we shall see how it compares on our next visit. This has always been one of the best Magic Kingdom table service restaurants in my opinion. Epcot happens to be my next favourite park. I love the different pavilions and could spend ages sampling lots of different food and drink and exploring the different cultures. I think there is a lot more scope for Disney character dining in Epcot, so fingers crossed more locations will be added in the future. For now there are just two to be discussed. Garden Grill can be found in Future World, a rotating restaurant that serves food family style for everyone to enjoy. I was very excited to book our dinner experience at Garden Grill and I really enjoyed the meal and the characters that arrived to see us. They include Chip, Dale, Farmer Mickey and Pluto. We think Garden Grill is one of the best restaurants in Disney World for character interaction. A lot of the food served at the Garden Grill is grown on site in Epcot in their Living in the Land greenhouses. You can learn more about this by taking a short boat ride on the attraction Living With The Land. Our dinner experience took around one hour to completely rotate the restaurant (you don’t notice you’re moving so don’t worry about motion sickness). It was quite amusing as you rotated past the front of the restaurant, everyone waiting was staring at you. 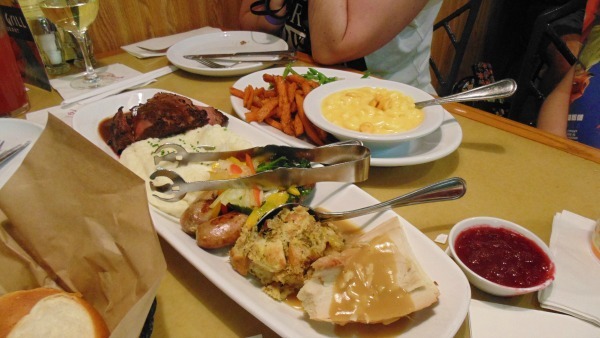 Our dinner included starters of salad and bread, followed by a platter of meats, mashed potato, stuffing, green beans, sweet potato fries, Mac and cheese and sausages. Any of the items can be asked for again, so if you love the sausages for example, just ask for some more and they will be brought to you. Dessert was an amazing strawberry shortcake that I have grown to love when visiting Walt Disney World. Make sure you leave some room. Garden Grill restaurant is available on the dining plan and will cost you one credit. This was one of the best Disney character meals I have enjoyed. If you’re looking to meet the princesses, then Akershus may be a good option for you. A one credit table service meal, Akershus often works out better value than Cinderella’s Royal Table. You will meet Belle on the way in, and during your meal you have the chance to meet Cinderella, Snow White, Aurora and Ariel. We haven’t taken the chance to experience Akershus for ourselves as yet, however you can expect to find some Norwegian meal options from the buffet and selected menu ordering options. There is a lot of change happening at Hollywood Studios currently, so for now there is only one Disney character dining location to share with you. Hollywood and Vine has a few options for the guest to experience. Enjoy breakfast with the Disney Junior characters, or enjoy lunch and dinner as part of Minnie’s seasonal dine. Minnie’s seasonal dine will change according to the season, so for example you can expect to see the characters in their Halloween costume during the Halloween season, and their summer clothes during the summer season. 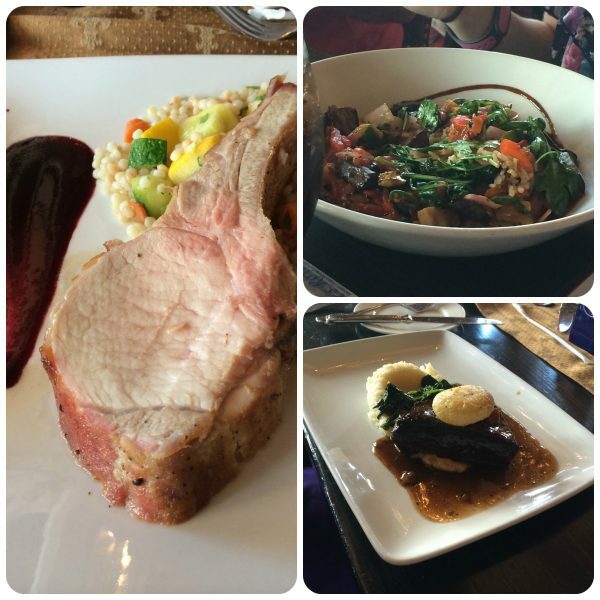 We enjoyed an early dinner during Minnie’s Summer Dine last year as part of the Fantasmic Dining package. This is available on the dining plan as a one credit meal, but it also provides you with a Fastpass ticket for the same evening’s performance of Fantasmic. Hollywood and Vine is a buffet restaurant, and during your meal you will meet Minnie Mouse, Mickey Mouse, Daisy Duck, and Donald Duck. 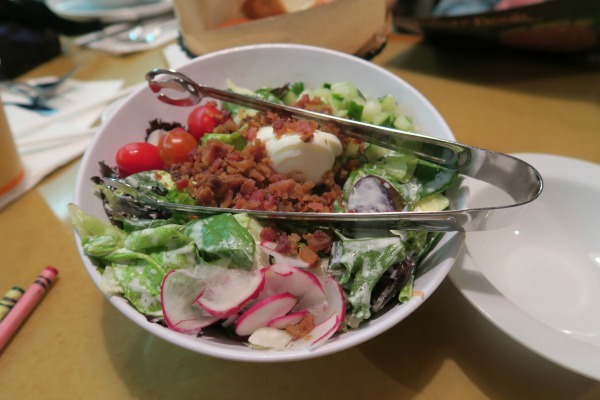 We found the food to be of average quality at Hollywood and Vine. There was a good amount of choice but it didn’t seem to live up to Crystal Palace for us. Animal Kingdom only has one Disney dining character location at the moment, but it’s definitely worth a visit if you can. Tusker House is the chance to meet Donald, Daisy, Mickey and Goofy in their safari gear. 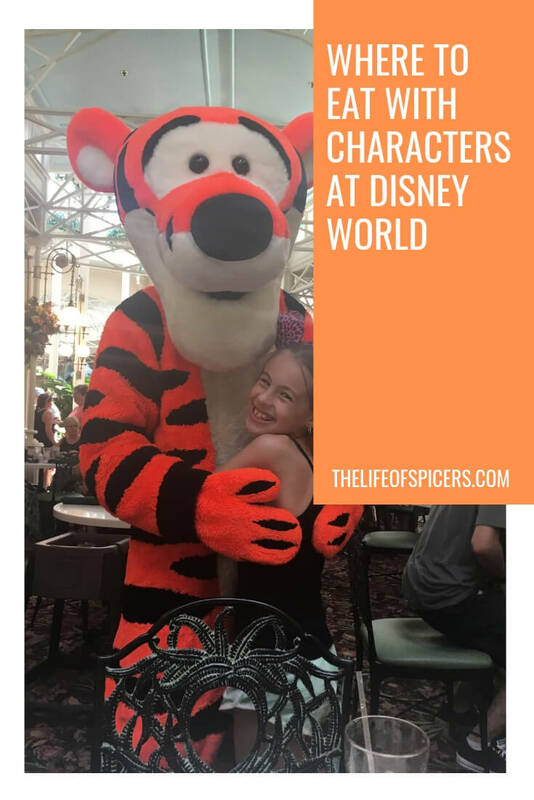 These Disney character dining options are such a fun way to meet the characters in costumes that you may not ordinarily see. Tusker House is also the place to go to try the jungle juice. 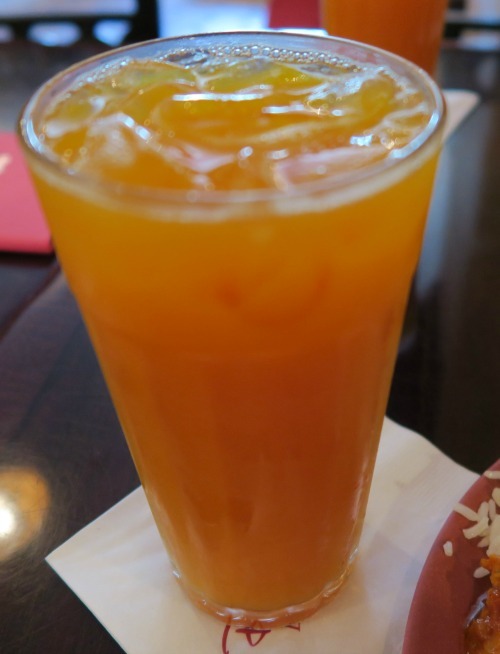 A mix of different fruit juices, its so refreshing on a warm Florida day. The restaurant is available on the dining plan and will cost you one credit. We enjoyed lunch at Tusker House and found the buffet food to be of very good quality and there was plenty of variety. We were able to spend plenty of time enjoying the food and meeting the characters as they came past for photos. There are plenty of character meals at Disney World to be found outside of the parks. 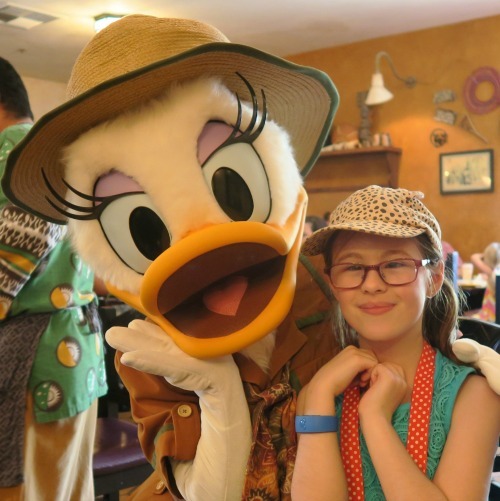 As we move into the resorts, it’s a good chance to see more of what Disney has to offer from their resorts, and enjoy a character dining experience at the same time. We almost made it to 1900 Park Fare at the Grand Floridian last year but our plans changed at the last-minute, so we will make another attempt next time. 1900 park fare characters during breakfast include Mary Poppins, Alice In Wonderland, The Mad Hatter, Tigger and Winnie The Pooh. Dinner service sees the appearances of Cinderella, Prince Charming, The Ugly Stepsister and Lady Tremaine. You can find Chef Mickeys in the Contemporary Resort, a short walk away from Magic Kingdom, or take the monorail and it stops right inside the Contemporary Resort. Chef Mickeys is a buffet style restaurant costing one table service credit on the dining plan. You can expect to meet Mickey Mouse, Minnie Mouse, Pluto, Goofy and Donald Duck. They will all be dressed in their chef whites. Visit Ohana restaurant in the Polynesian Resort for breakfast and you can meet Lilo and Stitch. I can only imagine the antics that Stitch must get up to here. Another one table service credit on the dining plan. 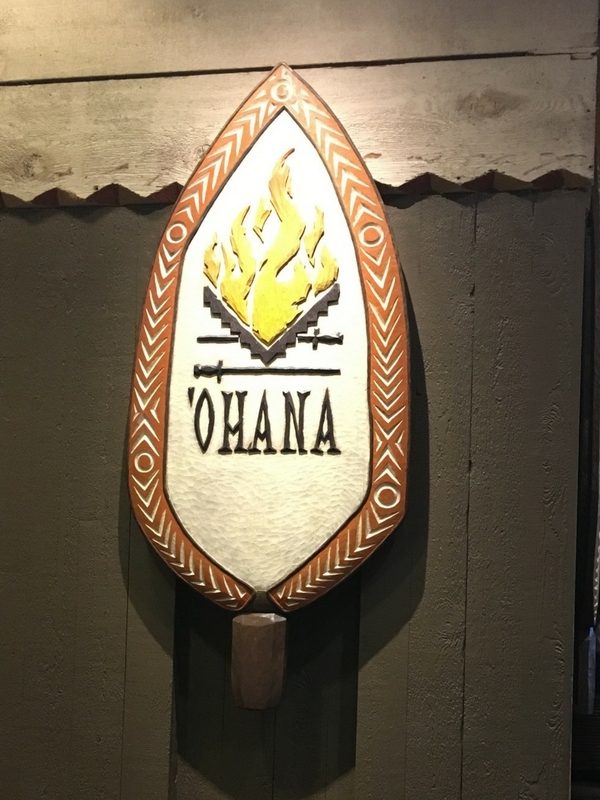 We have visited Ohana for dinner in the past, but dinner service isn’t a Disney character dining experience. You will find Cape May Cafe at the Beach Club. Characters appear only during breakfast service here, but you can expect to meet Minnie Mouse, Donald Duck and other favourites. The Beach Club is on my bucket list of places to stay at Walt Disney World in the future, and we will definitely enjoy this character breakfast when we do. We almost booked Mickey’s Backyard BBQ last year at Fort Wilderness, but the Hoop De Doo show won out instead for us. You can dine on bbq food with Mickey Mouse, Chip, Dale, Minnie Mouse and Goofy. Dance the evening away with the characters after you have eaten. This sounds like fun. Over at the Swan hotel, you can dine at the Garden Grove restaurant and expect to see characters join you during dinner service. They will also appear during breakfast at the weekends. I am quite looking forward to visiting the Boardwalk on our next trip to Walt Disney World so we can enjoy a Bon Voyage Adventure breakfast with Ariel, Prince Eric, Rapunzel and Flynn Rider. What a way to set you up for the day.